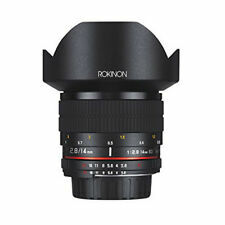 16mm Ultra Wide Angle F2.0 Lens This is Rokinon's newest addition to it's highly popular assortment of prime/fixed lenses. It is a extra fast, super wide angle lens that is constructed for APS-C crop sensor cameras. All cameras with cropped sensors will be able to realize the ultra wide angle effect of this lens. Basically, most of the cameras in the market have cropped sensors. The ones that do not are the more expensive cameras like the Canon 5D & 6D. This lens will vignette on full frame cameras like the Canon 5D & 6D. This lens will work on most popular cameras like the Canon 70D, 60D, T5, T4, T3, as well as the Nikon D7000, D5200, D3200, etc. The Nikon mount of this lens features a built-in AE chip to auto meter on your Nikon camera. Currently the AE chip is only available on the Nikon mount. Big, heavy, and takes great pictures. Coma and chromatic abrasions are very well managed. Sharpest once you get smaller than f2.8. Change your aperture control to "aperture ring" in your Custom Settings menu or you get an aperture reading of fEE and you can't shoot. My favorite, besides the 50mm 1.8D, this is the lens I use the most. Clear images, very luminous. Perfect couple for the D7100 or D7200. With their high ISO you can get sharp views of the Milky Way.